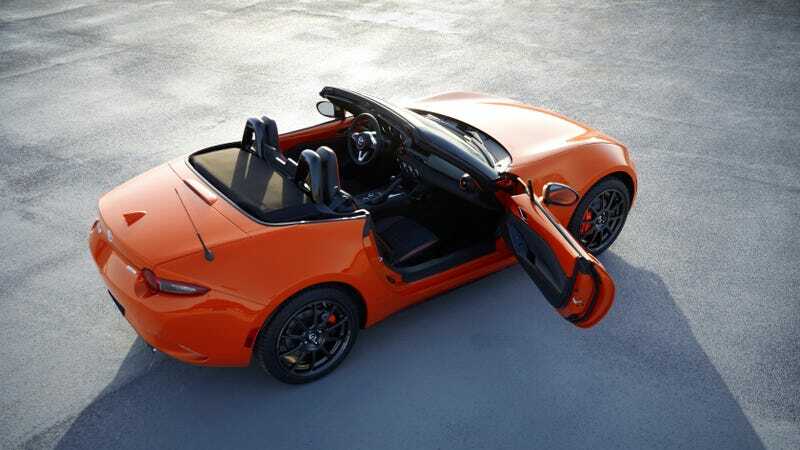 Just hours ago we told you about the Racing Orange MX-5 that Mazda debuted ahead of its official display at the Chicago Auto Show, and it’s already sold out. Only four hours after the deposit book opened, each and every one was accounted for. The car is limited to just 3000 units worldwide, and only 500 of them well be sold here in the U.S. market. All 500 of those units are spoken for. That’s right, 500 Americans heeded our plea to buy more Miatas by placing a refundable $500 deposit for the limited Mazda roadster. Pricing starts, or rather started, at $34,995 for a soft-top manual, or $37,595 for the RF, which seems like a lot of money until you read the amazing list of stuff the anniversary edition comes with. Aside from the bespoke color, the people who ordered one get Rays ZE40 RS30 wheels, Recaros, Bilsteins, Brembos, and Bose. Damn, that’s a great color, too. I’m definitely going to get a little bit excited every time I see one of these on the street. Just like when I see a MKV GTI Fahrenheit and shout “FAHRENHEIT!” My wife rolls her eyes at my childish enthusiasm every time.